Through the many years of coaching, we have done our best to provide quality advice to our players in their journey to becoming the best player/selves they can be. Your effort, your focus, your discipline, your game style, your technique, your schedule, etc. Worrying about things that are out of your control like: what the competition is doing, the ref, the draw, other people’s wins or losses, etc., is not a productive use of time and will not make you a better player. 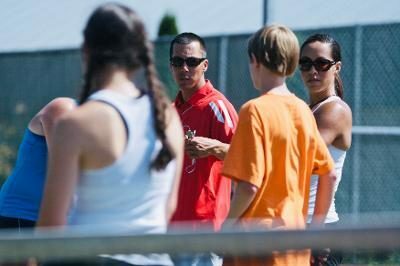 Practice every day as if your life depended on it because your tennis life does. Your final accomplishments in the game are just the sum and reflection of all of your daily efforts on the court. There is no time to waste. Ifs, buts, should haves, could haves or any other form of emotionally charged assessments, have no place when analyzing your performance. Look at every match coldly and objectively – what did I do well and what needs to improve? Then practice accordingly. Put your ego aside. Stop comparing yourself. Your level in tennis is always relative. You are great compared to some players and terrible compared to others. You do some things very well compared to some players and terribly compared to others. Who cares! Focus on what you need to improve and how to do it. Everything else is irrelevant. Not being in the best possible shape is unacceptable if you are serious about your game. There are many things you cannot control but conditioning is a matter of effort. Put in the time, do not sabotage your success. Seek competition and enjoy the challenge. Learning to compete is essential for success in tennis and the only way to do this by putting it on the line regularly. Do not shun away from the battle, seek it out and learn to enjoy it. Treat every match like the final of Wimbledon but let it go right after you are done. Only maximum effort will give you a true evaluation of where you are, so respect every match opportunity. On the other hand, once the match is over, analyze it and let it go. Leave the emotional baggage behind. Do not let the result of one match negatively affect the next matches. The competition is against yourself. The biggest challenge in tennis is understanding that a match is more about yourself than about the opponent. Regardless of who you play against, the goal is always the same: Achieve a mental and physical state that will allow you to play up to your potential, then slightly adjust your game based on your opponent. That is all you can really do. Winning or loosing is out of your control. The true battle takes place within you! Never forget that tennis is just a game. Tennis is so demanding that it tends to take over our lives. However, on the grand scheme of things it is quite insignificant. Tennis is not who you are, it is what you like to do. It is only a game. Unless you enjoy what you are doing there is no way you will be able to put in the hours and effort needed to be successful in this game. Work hard and take tennis seriously but never forget the fun. For more valuable advice, click here.